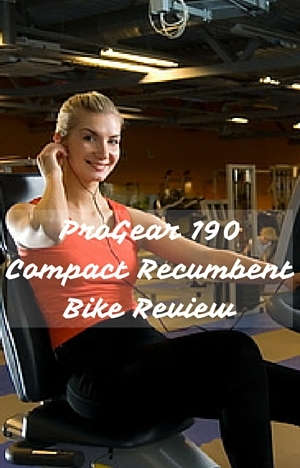 The ProGear 190 Compact Recumbent Bike with heart pulse sensors is an affordable priced bike with no frills except for a console for keeping track of your exercising and heart rate. Although described as recumbent you sit on it in more of a semi-recumbent position than a full recumbent position with your legs below you but out in front on an angle. In our review we take a look at how comfortable this different position is as well as its’ construction for stability and how quiet it is. We also look at how good it is for people who want low impact workouts for recovery as well as those wanting to get in shape and lose a few pounds or so. When not in use it can be folded up for storage in a closet making it a good space saving option for people in small homes or apartments as well as larger homes. I do talk about this later in the review but it is worthy of note that this bike seems to have one of the most comfortable seats of folding exercise bikes I’ve come across. This is a plus point for any bike but it is only one of the factors that we consider in our review. The bike is light for an exercise bike (38 lbs) despite this it does keep you steady as you ride at all levels of resistance. There is no wobbling or shaking or concerning creaks. You can just get on with your exercising and watching TV if you want. It does need to be used on a flat surface to prevent rocking as it doesn’t come with levelers to balance out any of the unevenness in the floor. A rubber mat may help if the bike does move slightly due to the floor not being level. The bike comes with a 1 year warranty on the frame and 90 days for the parts. People who have been using the bike regularly for a couple of years do say that it is still working well for them and with no issues. They expect to be using for some time to come. The seat is able to be moved to fit the bike for a range of heights between 5ft 2 ins and 6 ft 2 ins, so it can be used by a multiple users to get their exercise. To make the adjustments is quick and relatively straightforward to do. You undo the adjustment knob-pin on the seat post slide the seat into position and insert the knob-pin into the pre-set holes and tighten it back up. It is a little more awkward than other bikes because of the positioning of the knob and holes at the back of the post. The post goes up at an angle so the holes are pointing down and not directly in eyesight so you may need to crouch or bend slightly to line them up – but once it’s done a few times you should get the hang of it. At the lower end of the height range scale some people find they can’t reach the pedals (and it is only some) due to their leg length. To help with this they’ve put a cushion behind them that helps them sit more forward on the seat which they find is enough to reach the pedals and is also comfortable enough to exercise. Another trick that some people use if they struggle to reach the pedals or if they ate under the recommended height is to take out the adjustment knob and let the seat slide to its lowest position giving another inch or so. It’s not recommended by the supplier but people who have done it are happy with the result and still feel secure on the bike. The amount of resistance of the bike is controlled by the tension knob just below the console at the front of the bike – it has 8 levels of resistance marked. It is in easy reach but you may need to bend forward slightly to reach it. The resistance is provided by magnets that you move closer to the flywheel (inside the casing) by turning the tension knob clockwise to increase the amount you are pushing against and vice versa to reduce the resistance. It provides a consistent level of resistance and is quiet. The transition between the levels is smooth so there is no impact and you can keep a steady pedaling pace.. The resistance on the bike is fine for those looking for light or moderate exercise. For anyone who does a lot of exercise or is looking for more challenging low impact cardio workouts they are going to find it does get tough enough for them to get the workout they want and be disappointed with the bike. (Check out our best spin bikes under $500 for more challenging workouts but they aren’t in recumbent style bikes). At resistance levels of 1 – 2 it feels almost like you are freewheeling. Most people looking for moderate exercise find their level are between 3 – 6 which is enough to get a bit of a sweat up and raise the heart rate. Levels 7 and 8 are a little tougher and depending on your level of fitness can be too tough initially (unless you are in good shape). You may also find that the cycling motion can start to be a little choppy with it slowing down and then speeding up again as you push the pedal. It does add a little impact to the motion. The bike has a v-ribbed belt which gives a quiet smooth ride. It provides a good grip on the flywheel and pedals so the pedaling motion is consistent and there is no slipping. There should be no need to do any maintenance on the belt. The pedals are oversized with a textured surface and strap that provide the grip needed to prevent your feet from slipping off while you pedal. They are designed to fit house or athletic shoes. You could use bare feet, I guess, but the surface of the pedals would be uncomfortable/painful on your feet and is not recommended. The pedals are out in front of you but not in a full recumbent position – it is more halfway between recumbent and upright – described more as semi-recumbent. The position might feel a little awkward at first if you are used to riding an outdoor or upright bike but most find it a comfortable position. It helps to take some more pressure off the joints. The has been used by a number of people with knee issues or rehabbing (under doctors advisement) successfully to improve their strength and fitness. However, you may not like it as comfort is very much a personal preference thing. People who find it hard to sit on use a towel or cushion to get the comfort they need. An oversized sheepskin or gel seat cover and/or padded bike shorts can help too, if you do experience too much discomfort. The seat is fixed to the seat post using 4 bolts which is a different arrangement to the normal way of attaching a seat which is with three bolts making it even more difficult to replace the seat. But as it is regarded by most as comfortable or bearable at least by most who use it you are probably won’t need to worry about it. The backrest is more or less straight up and can’t be adjusted. It provides a good level of support to the back and can help if you’ve back problems. Noise. It is a very quiet bike with the belt drive and magnetic resistance making minimal noise. You can easily watch TV, listen to music or hold a conversation without having to increase the volume. You won’t disturb sleeping children or pets whatever time you want to exercise. If you live in apartment it is very unlikely your neighbors will know you are exercising. Any slight noise that might happen by the bike moving or causing a vibration can be prevented with putting the bike on a rubber mat. Handlebars. The handlebars are at the side of the seat and have the pulse rate sensors in them for monitoring your heart rate. You need to grip both firmly to get a reading on the console. They are about 22 inches apart and at a height that is comfortable for most people to use without being cramped or having to stretch to use them. Dust and Dirt. This bike will only add a little to your cleaning chores – that is to keep it clean from sweat to keep it looking good and working well due to its corrosive nature. You might want to put it on a rubber mat to protect your floor from sweat too. It will produce little or no dust and dirt on its’ own when being used for exercise. This is quite a compact bike but being able to be folded up helps to make it more of a space saver. It folds down to about 21 by 19 by 45 ins – making it small enough to fit in a closet or behind a door but is unlikely to fit under a bed. Folding it up is quick and easy to do. You fold down the back rest, remove the two holding pins at the center of the bike and support bar and close the bike and re-insert the holding pins to hold in place. To move the bike it has transport wheels at the bottom of the rear stabilizer bar that you tilt the bike on to. They work well on hard floors but can get stuck on soft carpets leaving you drag and pull or lift the bike to where you want to go with it. The bike weighs 38 lbs. The bike comes mostly assembled and you are required to finish the assembly. It is fairly straightforward and can be completed in 1 to 2 hours (many people complete it in less). The packaging and the manual have for some unknown reason been structured and written in a way to make this look much harder than it really is. First look inside the packaging can give you the impression there is lots of parts to put together. Then the first pages of the manual show an exploded diagram of the bike with every part of the bike shown – again you could think you’ve got a huge complicated job on your hands. You are just required to add a few pieces to the bike – the stabilizer bars, seat post, seat, backrest, handrails and console. The written instructions aren’t that clear but they are manageable. The hardware (nuts and bolts) and tools are plastic wrapped on a piece of cardboard to make identification of them easier. You can keep track of your workout with the console provided. It measures time elapsed, speed (mph), distance (miles), calories, odometer (total distance in miles) and when gripping the hand pulse sensors your heart rate. The console has a good size LCD display that is easy to read but you may find you have to lean a little forward to read it due to the angle it is installed at. It displays only one measure at a time. By pushing the mode button underneath the display you can choose which measure to display or you can choose scan by default where it rotates through them every 6 seconds. It starts automatically when you start to pedal and will turn off after 4 minutes with no activity. Apart from time and heart rate the measures are for guidance purposes only rather than to be relied on. The heart rate is also not 100% reliable as is the nature of hand grip sensors as they often understate your actual heart rate. The button can also be used to reset the numbers (except odometer) by holding it down for 3 seconds. The odometer is only cleared when you remove the batteries. The results of your exercising can’t be uploaded or analysed. You have to do this manually in your fitness a/c or journal or spreadsheet to be able to track your progress. It requires 2 AAA batteries that are included. They should last a few months before needing replacing. When they do need replacing it is easy to do by removing the battery cover on the back of the console. The bike doesn’t come with any accessories. With the back support it is possible to comfortably hold a book or tablet while you pedal. If you want to stop using them you do need to continue holding it and as you get off the bike. If you have a table near the bike you could use that when you’ve finished with it or want a rest from it. Some people buy an adjustable table that they can slide over the bike to use for putting their tablet or laptop so they can type or watch without having to hold it. The instruction manual has some tips on how to warm up but doesn’t include anything in the way of what workouts to try to get you started. Nor is there anything on setting the bike up correctly for your height. If you are unsure, you need to check out videos on YouTube. Most customers in their reviews are happy with the bike – it is better constructed than they expected. They can get their exercise when they want without any issues – its quiet (doesn’t disturb others), its stable and low impact make it a good choice to achieve their fitness goals in their own home. There are some people who have received a bike that shouldn’t have been sent out due to missing or defective parts. This is very much a small minority. The company does work with them to fix the issue when given the chance. As noted in a paragraph above, the majority of people of all ages with some into their nineties in their reviews they use the bike on a regular basis receive a very good bike for the price. This is an affordable priced folding exercise bike that most people feel is good solid and reliable piece of exercise equipment. It doesn’t come with many extras as you’d expect for the price. Comparing it to what you would pay for a gym membership and it pays for itself quickly especially as it can be used by multiple users too. When I checked at Amazon it qualified for free shipping and Prime. Although the bike is not a true recumbent bike, being more semi-recumbent it provides a comfortable and low impact cardio exercise that is great for people looking to begin exercising, lose weight, rehab (with doctor advice) or to generally stay in shape. It is quiet so you can do the exercise when you want and as you are doing it in your own home there is no rush to get the gym or deciding what to wear. The seat on the bike is worth mentioning because many people find it comfortable with the large bike seat and backrest providing the support needed for exercising without the hurt that is often associated with bike type seats. If you are looking for intense and challenging workouts this bike is not the one to go for. It is for those looking for light to moderate exercise. With that in mind, it provides a stable, reliable and low impact cardio workout that is saves on space and can help you meet your fitness goals. a very thorough review. I am currently studying up on what kind of equipment we will be getting, once we move from our rental house, to our own. At this moment, we have a gym in the community center, which is nice, so I would not want to miss having access to some good workout equipment. They have something similar to your bike there – pretty cool, actually.